The world's leading deep-sea mining company last week announced it had "unveiled" (sic) another high grade copper deposit at the bottom of Papua New Guinea's Bismarck Sea. Dubbing the deposit "Solwara 12", Nautilus Minerals made the new venture sound like a glorified expedition to another planet. Its Solwara 1 project is already said to be "ground breaking", while the "discovery" of Solwara 12 signified the possiblity of a "pipeline of projects in the Bismarck Sea" . The announcement is bound to deepen the alarm, felt by many in Papua New Guinea, that Nautilus has embarked on a hugely destructive enterprise. Just last week, their fears were confirmed by an independent scientific review of the company's environmental impact statement. Note: Nautilus Minerals is listed on the Toronto and London-AIM stock exchanges. Among its largest shareholders are UK-listed Anglo American (11.1%) and Canada's Teck Resources (6.8%). The Russian metallurgical holding company, Metalloinvest, beneficially owns 21.0% of the company's issued shares through Gazmetall Holding (Cyprus) Limited. An independent scientific review of the environmental impact statement (EIS) for the proposed Nautilus Minerals Solwara 1 seabed mining project in Papua New Guinea concludes the statement is completely inadequate and that the mining will result in severe and prolonged environmental impacts. A robotic gripper on an underwater submersible vehicle. The review, which can be downloaded below, was completed by Professor Richard Steiner, a member of the IUCN Commission on Environmental, Economic and Social Policy. Nautilus's Solwara 1 mine will dig gold and copper deposits from deep-sea hydrothermal vents which, says Prof Steiner "support one of the rarest and most unique ecological communities known to science". Prof Steiner says the mining activity will "destroy an extensive patch of productive vent habitat, including tens of thousands of vent chimneys, killing virtually all of the attached organisms". Although the EIS accepts "the extent of the impacts to vents and other seafloor habitats directly mined will inevitably be severe at the site scale," and "it may be many years before development of chimneys returns to pre-mining condition", Prof Steiner says the analysis is still seriously inadequate. The EIS does not present sufficient information with which the PNG government can effectively judge the project's expected impacts. The EIS is judged as not fit-to-purpose. Many risk contingencies are poorly analyzed, some are not analyzed at all, and many of the baseline studies necessary to understand potential impacts have yet to be completed. The report concludes that "it is likely that the project would result in severe, prolonged, and perhaps region-wide impacts to a globally rare and poorly understood biological community, and it is clear that the EIS does not adequately assess many of these impacts. Further, the benefits to local people or the economy of PNG seem disproportionately low compared to the scale and risk of the project". The PNG government granted Nautilus a license for the Solwara 1 mine on January 14. Read the Executive Summary from Prof Steiner's below or download his full report. 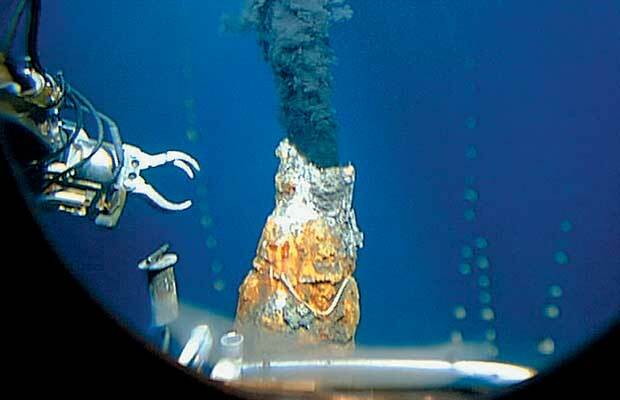 The Solwara 1 project proposes to commercially exploit gold and copper deposits associated with deep-sea hydrothermal vents at a depth of 1,500 in the Bismarck Sea off Papua New Guinea. As the Project would represent the first large-scale, human-induced, site-specific disturbance to the deep ocean basin anywhere in the world, it must be considered with exceptional deliberation and caution. Scientists only first discovered these deep-sea hydrothermal vents and their exotic chemosynthetic ecosystems in 1976, and these extraordinary ecosystems remain poorly understood today. Deep-sea hydrothermal vents, found along mid-ocean ridges and back-arc basins (such as the Manus Basin in the Bismarck Sea), support one of the rarest and most unique ecological communities known to science. Organisms derive their energy from sulfide chemicals in hot (350 C), mineralized vent fluids rather than directly or indirectly from photosynthesis as in other biological communities, and/or from endosymbionts in their tissues. Most species discovered at vents are new to science, and the vents support communities with "extremely high biomass" relative to other deep-sea habitats. Some scientists suggest that such deep-sea hydrothermal vents systems may be where life first evolved on Earth. The proposed Solwara 1 mining project would destroy an extensive patch of productive vent habitat, including tens of thousands of vent chimneys, killing virtually all of the attached organisms. The EIS states that: "The extent of the impacts to vents and other seafloor habitats directly mined will inevitably be severe at the site scale," and that "it may be many years before development of chimneys returns to pre-mining conditions (emphasis added)." And mining is expected to alter venting frequency and characteristics on surrounding seafloor areas as well, thus affecting the ecological communities of a much broader scale than just the mined site. Although the Solwara 1 EIA / EIS makes a significant contribution to deep-sea vent science, it is clear that the EIS does not present sufficient information with which the PNG government can effectively judge the project's expected impacts. Thus the EIS is judged as not fit-to-purpose. Many risk contingencies are poorly analyzed, some are not analyzed at all, and many of the baseline studies necessary to understand potential impacts have yet to be completed. For instance, studies of the taxonomy and genetic relationships of macro-invertebrate species found at Solwara 1, South Su (upstream about 2 km), and Solwara 8 (downstream about 45 km) have not been completed, and thus the degree of genetic variability and endemism of organisms between sites is not yet known. It is likely that several rare and endemic (found only at the site) macro-invertebrate species that are yet to be described by science exist at Solwara 1. As a result of the 2007 study at the mine site, "at least 20 new species have been added to the species list at active vent sites." This is a high rate of discovery of species new to science, and species encounter rates of the studies predict that there are likely many more species yet to be identified at the site. Such species would likely become extinct due to the mining project, even without having yet been identified or described. This alone constitutes an unacceptable risk. Bioethics dictates that resource development should not knowingly put species at risk of extinction, be they well-known charismatic macro-fauna (tigers, gorillas, whales, etc. ), or poorly known deep-sea invertebrates. She's been on dozens of submersible dives to explore colonies of strange animals, worms and microbes that thrive on hot water percolating out of the sea floor, which researchers believe may have been the cradle of life. "There are creatures of extraordinary beauty down there, exquisitely adapted to their environment," she said. There are also such rich deposits of gold, silver, zinc and copper that companies want to start "open-cut" mining around deep sea vents, with a Canadian company leading the way in waters in the southwest Pacific Ocean. Van Dover, a leading U.S. marine biologist at Duke University, is calling for deferral of "wholesale commercial mining" of the seabed until conservation plans are in place. In a report to be published Thursday in the journal Nature she likens deep-sea vents to the geysers in Yellowstone National Park, one of the most celebrated natural wonders in the U.S.
"It is easy to see what would have been lost had Yellowstone been turned over to miners instead of park rangers," writes Van Dover, who says there is an "urgent need" for regulation and conservation planning before companies start digging into the sea floor. In January, Nautilus Minerals of Toronto won the world's first deep-sea mining lease from the government of Papua New Guinea. Its target: copper and gold around hydrothermal vents 1,600 metres underwater. The company says it plans to start mining within three years and dig into the sea floor to depths of 20 to 30 metres. The mine, says Van Dover, will disrupt an "an area equivalent to about 10 football fields." The International Seabed Authority, which has jurisdiction over mineral resources in international waters, has also received applications for mining exploration of other sea-floor deposits. The China Ocean Mineral Resources Research and Development Association has its sights on the Southwest Indian Ridge, and Russia has applied to work on the mid-Atlantic Ridge. Marine and environmental scientists have been saying for years that vent sites need protection, but Van Dover reports policies for conservation "have not kept pace" with mining interests. In international waters, she says, "there are gaps - some say chasms - with regard to regulation, governance and conservation of special habitats in the deep sea, whether they are hydrothermal vents, cold seeps or deepwater coral reefs." And rules that do exist are inconsistent. "The Food and Agriculture Organization of the United Nations lists hydrothermal vents as vulnerable marine ecosystems to be protected from regulated fishing," she says. "As a result, seamounts in the South Pacific are protected against bottom fishing. But mineral extraction, which has the potential to destroy the very same habitat, is not prohibited." In territorial waters standards are developing "ad hoc", says Van Dover, who has done research for Nautilus, which has funded studies on the impacts of their proposed deep-sea mining operation in waters off Papua New Guinea. Papua New Guinea's national environment agency "has not yet set aside sea floor vent ecosystems for conservation in any systematic manner that might protect biodiversity from the effects of mining," she says. There is an "urgent need" to establish regulations and conservation guidelines before mining begins in international waters, says Van Dover. And she says countries allowing mining in their waters should comply with global conservation targets, adopted by the Convention on Biological Diversity. Nautilus officials declined interview requests but said in an email statement that deep-sea mining "offers many potential advantages compared to land-based operations" since the deposits are richer, will generate less waste and "minimal social disturbance in that no one needs to be relocated from the extraction site." Nautilus says it has plans to minimize the environmental impact of its proposed mine, which include " relocating some animals out of the path of extraction" and taking measures to "aid in animal population recovery." Van Dover acknowledged Nautilus' efforts but says "we still don't know how best to mitigate mining activities or to restore habitats in the deep sea." There several reasons, she says, for "deferring wholesale commercial mining until proper conservation plans are enacted."